How do meteorologists classify thunderstorms? Single-cell—the smallest type of storm system, single-cell storms form from a convective loop of warm updrafts and cool downdrafts. They usually form the weakest and briefest rain storms. Multi-cell—a storm system formed from two or more storm cells. Supercell—the largest and most dangerous type of storm system, and one which is often associated with tornadoes. 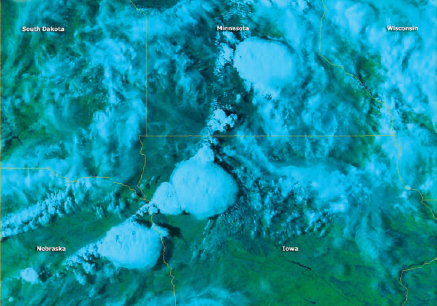 Supercells develop in massive cumulonimbus storm clouds and are characterized by nearly vertical, unsuppressed updrafts and precipitation falling at a nearly horizontal angle. Because the air currents are not suppressed, they tend to continue building in strength for hours. Squall line—a line of cumulonimbus storm clouds reaching up to 600 miles (965 kilometers) long.